Welcome to the Official Rainworks Tutorial! Click on each section below to learn everything you need to know about making rain-activated art! What would make you smile on a rainy day? Our motivation is to give people a reason to look forward to rainy days, so whenever we come up with designs we ask ourselves: what would it be cool to stumble upon in the rain? We usually try to make our designs motivating, funny, educational, or just aesthetically pleasing. When coming up with a rainwork design, it's important to remember that you only have 2 colors to work with: the color of dry concrete (light gray) and the color of wet concrete (dark gray). It can be a fun challenge to work within these boundaries. Once we've thought of an idea for a design, we usually sketch the concept out by hand and then switch to a vector program like Inkscape or Adobe Illustrator. 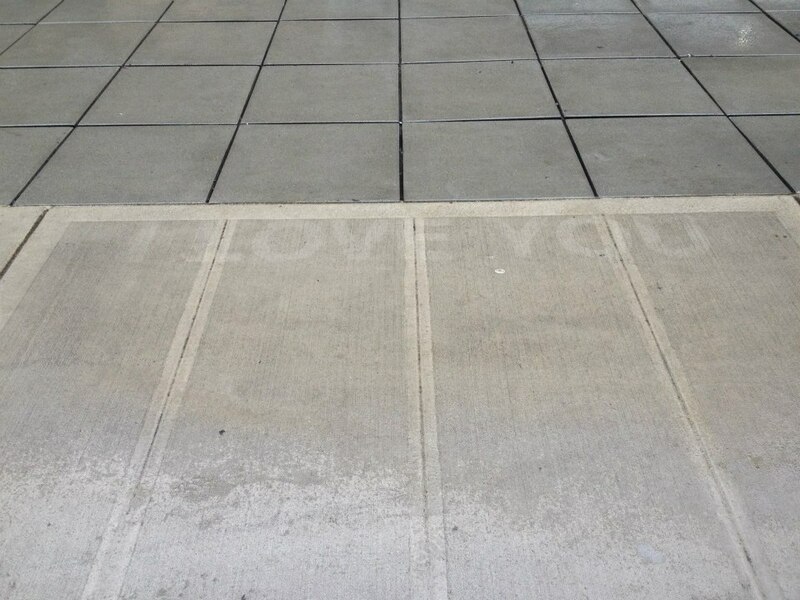 When making rainworks stencils, it's best to find a material that is slightly absorbent. Invisible Spray does not stick to the cement like spray paint, it is runny (almost like water). A stencil material that is slightly absorbent will help prevent the spray from running off the stencil and onto the cement in un-wanted ways. But, you don't want it to be too absorbent (like standard printing paper for example) because the Invisible Spray will soak right through and your design will bleed. These types of material or not ideal for making Rainworks, because the Invisible Spray will either run off of these materials when you pick them up, or it will bleed through and distort your design. Also, some materials will warp and bend once they have been sprayed. When you get to installing your rainwork, you'll discover that concrete is prone to bleeding. This makes it difficult to make rainworks with fine detail; small designs are much more likely to distort. So, we recommend making your rainwork stencil as big as possible, for the best results. Thick letters always come out best, so we recommend making your letters at least 3/4". If your design is too large to fit on one piece of material, use multiple pieces of overlapping stencil and use a pen to mark to alignment. Check out the 'Making Stencils' video above for more details on marking alignment. The classic way to create a stencil is to create it by hand. Start by drawing your design onto your material with pencil. Then, go over your final lines with a pen before cutting. We recommend using a box cutter for thicker materials like cardboard, and an exact-o knife for thinner materials such as card stock. Check out our 'Making Stencils' video for an in-depth guide on hand-making stencils. If you have access to a digital projector, you can project the design onto your material, trace the projected image, and then cut the stencil by hand. This is a great way to create detailed, accurate stencils. Most of the stencils that we create are made using a desktop cutting plotter. Specifically, we use a Cameo Silhouette cut out our stencils. We have also used CNC machines and laser cutters for larger stencil designs. Cut out the 'counter' for your letters - the floating pieces inside of the letters such as "o", "e", "p" or any letter, and place them where they go inside your stencil. Then, use tape to hold them in place. We recommend using Cold Weather HVAC Tape. Normal tapes (such as duct tape, packaging tape, painters tape, etc.) use a rubber-based adhesive, which breaks down when you spray it with Invisible Spray, but HVAC Tape uses a silicon-based adhesive that will stand up better to the solvent in Invisible Spray. Once they are taped, we like to use a hot glue gun to secure the strings in place and keep the counters in the right spot. This can help make your stencil more durable. To learn more about string theory, skip ahead to 3:20 in our 'Making Stencils' tutorial video. Rainworks can be made on any surface that changes color when it gets wet. Our formula has been developed specifically for use on concrete, but can be used on other surfaces such as wood, stone, and brick. An example of how different types of concretes have different contrasts. Rainworks are visible due to the contrast between the sealed, dry surface and the unsealed, wet surface. If you're curious about whether you can make a rainwork on a specific surface, simply test the surface by pouring some water onto it. If the surface changes color when it gets wet, you can make a Rainwork there. The more drastic the contrast, the better your rainwork will look. Invisible Spray will not work on smooth surfaces such as glass, plastic, metal, granite, or marble because those materials are not absorbent, and they do not change color when they get wet! According to a representative at the Seattle Department of Transportation, Rainworks are legal, because they are temporary, don’t harm the property, and don’t advertise anything. See this article for the interview I am referencing. Basically, Rainworks fall into the same category as chalk art. That being said, we have not investigated the legality of making Rainworks in other cities. We cannot guarantee that every city will share Seattle's awesome policy on rainworks, but we hope they choose to follow suit. Of course, we always recommend getting permission from the property owner before creating a rainwork. The first step to installing a rainwork is to clean the surface. When you arrive on location, use your brush to clean the area of any dust and debris. The cleaner the surface is, the longer your rainwork will last. For best results, we recommend pressure-washing the sidewalks a few days prior to installation. Also, the surface must be completely dry during installation. Next, lay your stencil down in place. 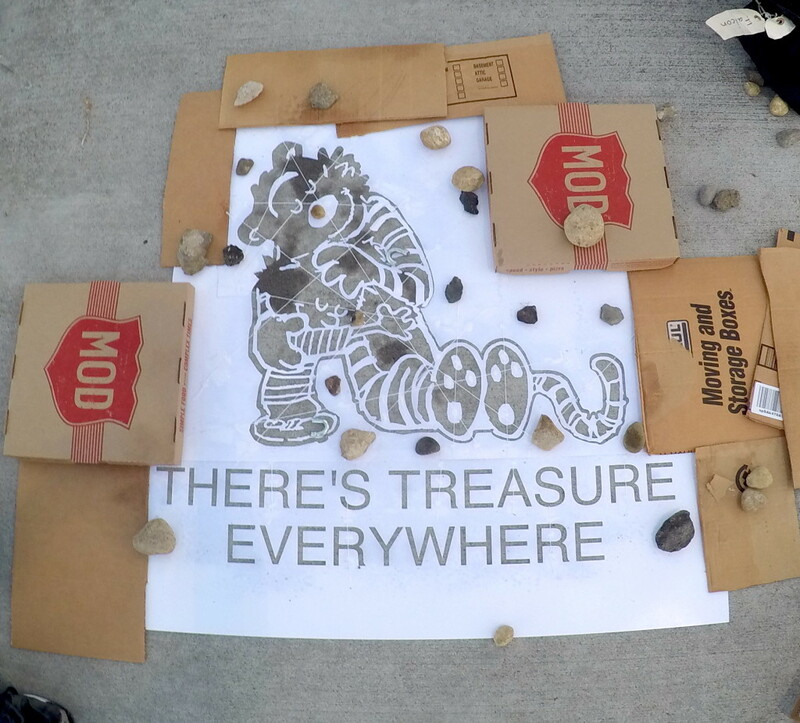 We recommend using small rocks to weigh down the stencil so that it does not blow away in the wind. You can also use pocket change or chain links as your stencil weights. Alternatively, you can use the painter's tape to secure the stencil in place. Use cardboard around the edges of the stencil to prevent overspray. Avoid getting Invisible Spray outside the perimeter of your design. We've done it accidentally, and it can make a great rainwork design look sloppy. Avoid this kind of over-spray by protecting the stencil edges with pieces of cardboard. We recommend installing on a sunny day. Sunlight makes Invisible Spray dry faster, which will prevent bleeding and save you time. If there is one thing you learn from this tutorial, let it be this: Spray lightly! Our formula utilizes nano-technology which means that a little bit goes a long way. It doesn't take much spray to create sharp-looking, long-lasting rainworks. Hold the spray bottle ~6 inches above the ground, and sweep your hand as you pull the trigger. Release the spray as a fine mist above the stencil, and let the spray settle down onto the cement. Spray just enough for the concrete to visibly dampen. Be sure to spray as evenly as possible. If you spray too heavily, you will see the spray puddle up and begin to bleed. If this happens, you can lightly touch the spot with a paper towel to help reduce bleeding. You can use cardboard as wind-protection, to prevent the spray from being blown away in the wind. Apply one coat, then wait for about 5 minutes. When you spray the first coat, you will notice the concrete dampening where you've sprayed. If spray becomes over-saturated, your design can bleed and distort, so be careful to spray very lightly and evenly. After the first coat has been applied, wait until the concrete is visibly dry again, then you may proceed with the second coat. Be careful not to move the stencil in between coats! Spray even lighter on the second coat. Once you've applied 2 coats of Invisible Spray, your rainwork is officially installed! You can now safely pick up your stencil without damaging your work. 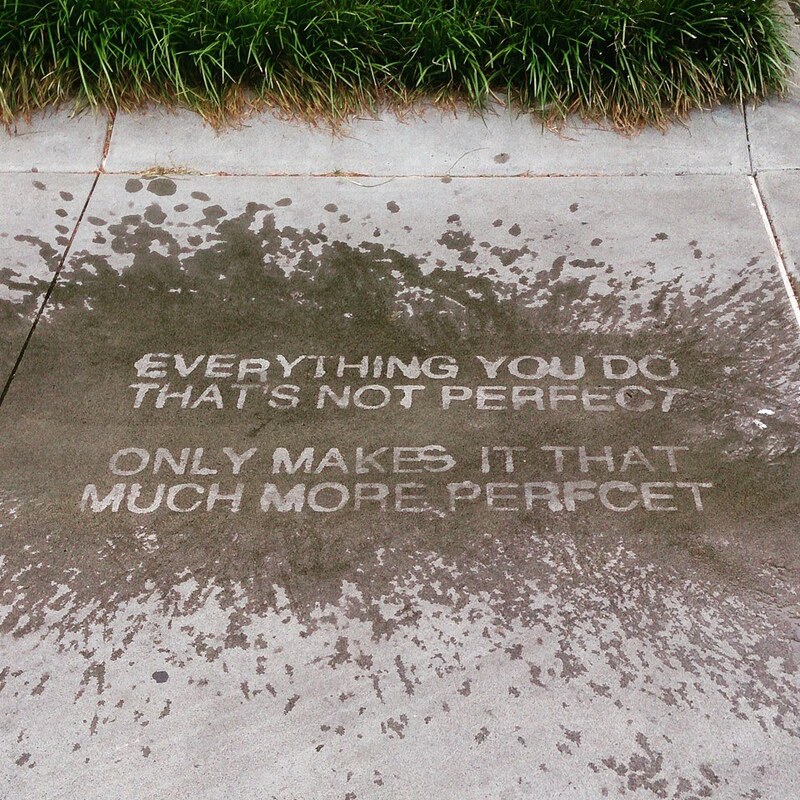 Be careful not to let any Invisible Spray drip onto the concrete or you will create blemishes on your design. Clean up your supples and leave no trace! Wait 24 hours before getting wet! It takes 24 hours for Invisible Spray to settle into the concrete, so we recommend waiting a full day before revealing your creation. Rainworks are designed to give people a reason to look forward to rainy days. So our favorite way to reveal rainworks is by simply waiting for the weather to turn on the artwork! Want to get the whole community involved with your rainwork reveal? Water balloons are a fun way to get everybody involved in the unveiling. Remember to pick up all of your balloon bits when you're done! A standard garden mister provides a very cool, gradual reveal that doesn't use too much water. Simply pouring a bucket or bottle of water can provide a quick, eye-catching reveal. Once you've revealed your rainwork, be sure to share photos and videos with our hashtag #RAINWORKS! The Rainworks Map is a fun component of our vision. This global map keeps a record of the rainwork locations around the world, so people can go out and find them. We love the idea of people adventuring to find rainworks on rainy days, and the map makes it easy & fun to help people find the rainworks in the real world. If you do not have a smartphone, you can still submit your rainwork to the map. Check out this page to learn how! *The Rainworks Team reserves the right to refuse any submission to the map. Remember, the goal is to make people look forward to rainy days! Rainworks are temporary, and they last 2-4 months on average. They are most vivid for the first few weeks, and they gradually fade over time. That being said, you can always remove a rainwork if you feel so inclined. Our formula is sensitive to cleaning products, so rainworks are very easy to clean off. First, find the location of the rainwork you'd like to remove. Let the cleaner soak into the concrete for a few minutes. Use a wire-brush to scrub the area. Repeat until the rainwork is completely gone. Please note: This method of removing a rainwork works great on a clean, concrete surface. We do not recommend using this removal process on wooden surfaces, or other delicate surfaces that might get damaged by a wire-brush. This method of removing a rainwork will also clean a surface if it is dirty. If you created your rainwork on a dirty surface, removing it might create a color contrast between the clean concrete and the dirty concrete that is more drastic and long-lasting than the rainwork you were trying to remove (see "reverse graffiti"). If you installed your rainwork on a clean surface, this won't be a problem. However, if you installed your rainwork on a dirty surface, you might be better off letting it fade naturally rather than removing it with the wire-brush. "They look blurry or distorted!" Blurry edges, and other mistakes. This is probably the most common problem that we see people run into while creating rainworks. If you spray too much Invisible Spray onto the concrete, it will cause bleeding. Basically, if you notice the liquid pooling up on the concrete while you are spraying, then you are spraying too heavily. All you need is a gentle mist to soak into the concrete. If you use attempt to make a stencil using paper or fabric, the Invisible Spray will soak through the material and cause the image to bleed. When you design your stencil, make sure to keep your lines thick and make your stencil big. Bigger is better! Sometimes we try to make a rainwork, and the concrete is unpredictably absorbent. This can make it hard to spray without bleeding, especially for smaller and more detailed designs. If you run into some of this super-absorbent concrete, we advise you to spray extra lightly and perhaps apply an extra third coat after the second has dried to compensate for the lightness of the coats. The cleaner the concrete in when you install, the better they will come out in the end. If you attempt to make rainworks on old, dirty concrete, they probably won't come out as good, and they will probably fade away much faster. The concrete doesn't have a good enough contrast. A rainwork that came out faded. If you attempted to make a rainwork on dark-colored concrete, dirty concrete, or old concrete, the change between dry-concrete and wet-concrete may not be very noticeable. This lack of contrast can result in a faded-looking rainwork. The concrete wasn't dry during installation. It is important while installing a rainwork that the surface is completely dry during installation. If there is still moisture in the cracks of the cement, our formula will not be able to settle properly. You may have sprayed too lightly. When installing Rainworks, we advise you to spray very lightly because a little bit goes a long way. That said, it is possible to under-spray. If your rainworks are on beautiful, new, white concrete and they still came out faded then you probably sprayed a little too lightly and you can try using a little more Invisible Spray next time. "They aren't invisible when dry!" Did you use an off-brand superhydrophobic coating? Check out Invisible Spray, our official, completely invisible formula. Most other super-hydrophobic coatings have a bluish, whitish haze that can be seen while dry; Invisible Spray is the only product we have tested that is completely undetectable when dry. If a concrete or wooden surface has been pre-sealed, the sealant will interfere with your rainwork, and will prevent it from being invisible. Similarly, some materials (such as asphalt) are mixed with water-repelling ingredients that will have the same interfering effect and cause your rainwork to be visible when dry. Be sure to install on an unsealed surface. See our 'Finding A Location' section for more details. 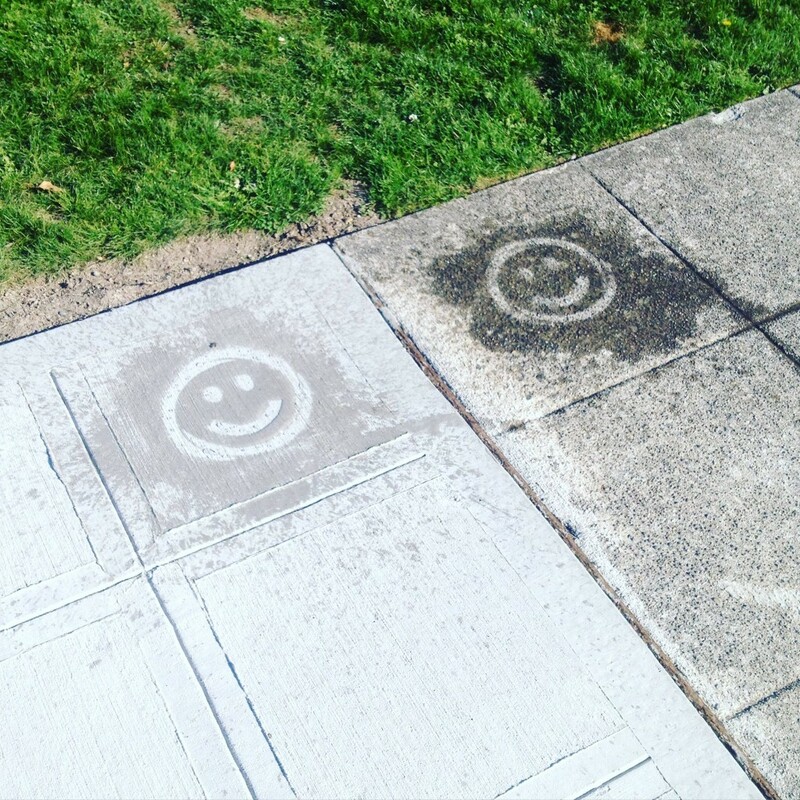 If you install a rainwork on a dirty surface, the Invisible Spray will actually clean the concrete which can make your design visible when dry. You can avoid this by installing on clean concrete. The recommended shelf-life of Invisible Spray is ~1 year. If you purchased the spray over a year before installation, it's possible it may react differently on some surfaces. When you create a rainwork, a nano-thin force-field is created, protecting the surface form getting wet. However, if you apply too much spray, the layer will no longer be nano-thin, which might make it visible to the human eye. This is another reason why we put so much emphasis on spraying lightly! If you have any further questions, you can contact us at contact@rain.works for help troubleshooting.